Testing floating compasses. Building solar ovens. Dissecting owl pellets. These are just a few of the hands-on, inquiry based science projects that nearly 1,500 Alum Rock District students experienced in 2012. This innovative science education collaboration led by the Youth Science Institute (YSI) and Resource Area For Teachers (RAFT) offered every 4th through 7th grade students an in-depth, standards-based science activities consistent across all four schools in the “Ocala Cluster” – Ocala Middle and Cassell, Rogers, and Ryan Elementary Schools. Students experimenting with a RAFT Activity Kit. California public school students often enter middle school unprepared in Science. As few as 10% of California public elementary school students regularly experience high-quality science curriculum, particularly hands-on projects. The content and frequency of science educations varies widely from class-to-class and across grade levels, particularly in low-income districts such as Alum Rock. As a result, most students are not adequately prepared to take the high school lab sciences that are part of a college preparatory curriculum. YSI and RAFT engaged the four school principals and Walden West, another leader in hands-on science, to ensure that every student received high quality science education. Together, they developed a rich, standards-based program aligned across grade levels and consistent across schools. RAFT’s teacher training and “Activity Kits” complemented YSI’s field trips to Alum Rock Park and Walden West. RAFT taught teachers effective, practical, and accessible strategies for engaging students, providing kits designed to match the curriculum. 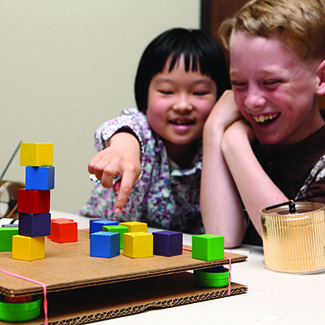 Students participated in interactive experiences such as “Electricity and Magnetism,” “Animals and their Adaptations,” and “Roots, Shoots, Seeds, and Leaves.” YSI’s and Walden West’s outdoor settings offered students – many of whom who have had very limited exposure to the natural environment – to take nature hikes and interact with live animals. All lessons incorporated “21st century skills” of collaboration, creativity, and communication, with students working together in the classroom, brainstorming ideas, and describing what they learned about being respectful stewards of their environment. In 2013-14 the partnership is expanding to include modules on sustainability and green technology. Together YSI and RAFT evaluate student learning and teacher skill development. Evaluation results are encouraging: students showed an increase of up to 50% in academic understanding of science concepts. Standardized test scores in Science have also risen at three out of four schools between 2010 and 2012, with Ryan Elementary’s percentage of students scoring “Proficient” or “Advanced” jumping from 33% to 64%.